Is the Bible an ancient document that has been tampered with? Has it been edited many times over the centuries and now is filled with errors? How can we know what the Bible really said when the originals no longer exist? Bestselling books that promote these doubts, such as Bart Ehrman's Misquoting Jesus: The Story Behind Who Changed the Bible and Why, are influencing today’s news media, and these teachings are being treated as fact. Now is the time to address the topic of textual criticism in our churches and help Christians become better informed — ready to "defend the faith." 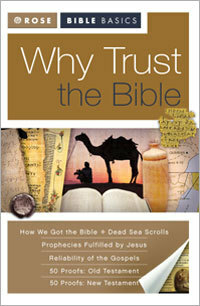 "The Bible can be trusted," explains author Dr. Timothy Paul Jones in Why Trust the Bible The good news is that the Bible is reliable, even though it was hand copied and there are variations between texts. This book explains the variations and why they don’t affect the trustworthiness of the Scriptures. The Gospels were written long after Jesus lived by people who weren't eyewitnesses. The stories about Jesus' life and death were not handed down reliably and not recorded accurately. The New Testament wasn't finalized until hundreds of years after Jesus and his disciples, so there could have been many other "Gospels" accepted and later rejected—in addition to the four Gospels found in the Bible today. The originals of the Bible are lost, therefore we have no way of knowing what it actually said. The Bible was edited by people who had an "agenda" and changed many teachings.